Updated Monday December 3, 2018 by Kitchener Sports Association. PHOTO: KSA Volunteer Recognition Dinner 2013: KSA's Volunteer (l-r): Kelly Galloway-Sealock (City of Kitchener Councillor), Russ Woloshyn (award recipient) and KSA President Bill Pegg. Groups wishing to participate in the celebration on November 2019 should have their nomination information submitted 2 weeks before the dinner date. (Details TBA) The nomination and dinner reservation forms are expected to be very similar to those used in previous years. (See attachment). Specifics to be confirmed. 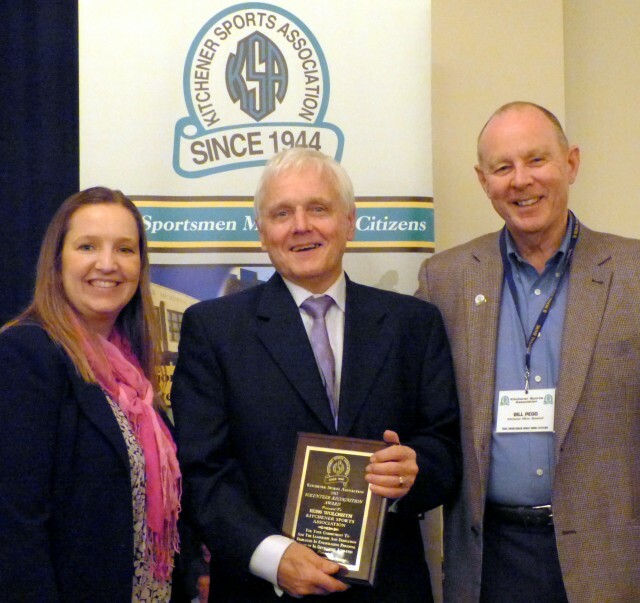 In Canada, the year 1989 was designated as the "Year of the Coach" and KSA, in collaboration with the City of Kitchener, established a KSA meeting to recognize volunteers within the Kitchener minor sports system. Nine individuals were nominated and acknowledged that first year. The success of the 1989 program provided momentum for KSA to annually host a Volunteer Recognition Dinner whereby each of the 35+ minor sports organizations and, more recently, other local (Regional) non-profit sports organizations, can nominate a deserving volunteer for recognition. While the event includes dinner and special guest(s), the "stars" of the night are the nominees, each of whom is introduced by a representative of the minor sport association and receives a personalized plaque commemorating the occasion. KSA covers the dinner cost for each volunteer award recipient and his/her presenter. The stories behind these fine volunteers are always inspiring and often humorous. Our community is fortunate to have such dedicated people in our midst, and KSA and the City of Kitchener are pleased to provide this annual program.